Did he have an Indian wife? Persistent stories of two early Gentry men marrying Indian wives are examined. In the case of David Gentry, the question is one of the identity of David. In the case of Elijah Gentry, the question is whether or not there was a marriage. Cherokee Indian legends tell of Tiana (also known as "Diana" and "Talahina") Rogers, who was famous for having been married briefly to Sam Houston, following his term as Governor of Tennessee and before he became President of the Republic of Texas. These include a statement that she was married first to a David Gentry. To simplify later discussions, we will refer to him here by the nickname, "Cherokee David". We present here a summary of what we have found about David and discuss his possible ancestry. Any discussion of David Gentry needs to start with the tangled relationships of the family into which he married. For this, following Cherokee matrilineal custom, the family has been described as being descendants of a Cherokee woman, Elizabeth (of the Long Hair Clan) who married Ludovic Grant, a Scotsman, in approximately 1720 (see chart below). A daughter, Mary Grant, was married in the 1740's, to William Emory, an Englishman by birth, who settled among the Indians in the Cherokee Nation East (eventually Tennessee). This and the other relationships below are taken primarily from the compendium of Cherokee genealogy prepared by Emmet Starr, "History of the Cherokee Indians and Their Legends and Folk Lore", and first published in 1921<1>. According to this genealogy, among Mary and William Emory's children were a daughter, Mary Emory (born about 1745), and a daughter, Elizabeth Emory (born about 1748), both one-quarter blood Cherokees. Mary Emory married Ezekial Buffington (some accounts have Mary's sister also marrying Ezekial Buffington, a marriage ended by divorce). Among their children was a daughter, Mary Buffington, estimated to have been born about 1772, who is said by many accounts to have married first (in about 1791), James Daniel. Existing genealogies, including Emmet Starr, are very confusing concerning whether this Mary married second, David Gentry, in about 1803, or whether David's wife was another Mary Buffington, the daughter of Ezekial Buffington and Elizabeth Emory. In any case, this first marriage of David's resulted in three daughters, Elizabeth Gentry (born in about 1806), Isabel Gentry (born in about 1810), and Patience Gentry (born in about 1812). Of these three, Elizabeth has been identified further as marrying Ezekial Williams and having a daughter Mary Williams (born about 1830). Her two sisters are listed by Emmet Starr as "dying without issue". Mary Emory's sister, Elizabeth Emory, is said to have had several husbands (including perhaps as indicated above, Ezekial Buffington). One of these husbands was Robert Due, whom she married in about 1765 and by whom she had a daughter, Jennie Due, born in about 1766. A later husband of Elizabeth was Captain John ("Happy-Jack") Rogers, a well-known operator of a trading post in one of the many Cherokee villages along the Little Tennessee and Hiwassee Rivers in the Indian Territory of Tennessee. Some time after John's wife Elizabeth died, John married his step-daughter, Jennie. Among the children of this marriage was Tiana Rogers, who is estimated variously as being born between 1796 and 1803. There is no evidence whatsoever as to what happened to David's first wife, Mary, and their children - whether she died and the children were raised by David or by other family members, or whether David left Mary, or whether David married a second time while still married to his first wife. At any rate, David married Tiana (also "Diana") Rogers, one of the younger daughters of John Rogers and Jennie Due, perhaps a little before or after 1820. [Tiana's name as it appears in the official documents found in the War Department and Bureau of Indian Affairs is spelled both "Diana" and "Dianna" Rogers. Her name among the Cherokee was "Tiana", supposedly because the Cherokees had difficulty pronouncing the "d" in Diana, so we will use it here. The name "Talahina" found on her gravestone seems to have no foundation in fact.] A graphical representation of the more commonly accepted version of these family relationships is given below. One can find variations of the above genealogical summary in various places, which considering the tangled family lines, is not surprising. Emmet Starr's genealogy appears to be the standard used by descendants of these families. As we know from Gentry experience with Richard Gentry's, "The Gentry Family in America", one should not put complete faith in this book by Starr. Undoubtedly some of his information needs modification, and some may be completely in error, if we but knew where the errors lay. We can at least presume that it is a fact that David Gentry married a Mary Buffington, a woman of mixed blood, and then later married another woman of mixed blood, Tiana Rogers. Tiana by all accounts was considerably younger than David, by fifteen to twenty years. It would be interesting to know whether this was a marriage sparked by romance, or was more of a marriage of convenience or family relationships. There is some controversy as to whether David and Tiana had any children, but Emmet Starr and others credit them with two daughters, Gabriel (estimates of birth range from 1820 to 1825) and Joanna (estimates of birth range from 1822 to 1826), both of whom Emmet lists as dying without issue. David is assumed to have lived with Tiana until he was killed in about 1829, supposedly in a border skirmish between Cherokee and Osage Indians, in Oklahoma Territory. In the years just before his death, Fort Gibson had been built in Oklahoma in 1824 to keep peace between the Cherokee and the Osage, and in 1828, the Cherokee were forced to leave their lands in Arkansas and move to Oklahoma. After David's death, Tiana married Sam Houston, whom she had apparently known for a number of years. This marriage, in an Indian ceremony, is said to have taken place about 1830, in spite of the fact that Sam was still married to his first wife. This was during a period in Houston's life after he was elected Governor of Tennessee in 1826 and then resigned the governorship in 1928 and retired in exile to the Cherokee territory in Arkansas. Subsequent to this, a biography of Tiana in "Pitter's Cherokee Trails", comments, "Several years later Houston, being a restless soul, took off to liberate the Republic of Texas. He asked his Cherokee wife to go with him but Tiana wanting to settle down refused to leave [her home in eastern Oklahoma]. Later both Tiana and Houston remarried and in 1838 Tiana Rogers Houston died of pneumonia." Tiana was buried in an unmarked grave, but in 1904 at the urging of her supporters, the remains of Tiana were exhumed from her supposed grave and reburied in the "Officers Circle" at Fort Gibson National Historical Cemetery, Muscogee County, Oklahoma, where her headstone is marked, "Talahina R. wife of Gen Sam Houston" (photos of the gravestone can be seen at several websites relating to the Fort Gibson cemetery). The statement that David was a half-breed has very little likelihood of being true. It is significant that Emmet Starr makes no mention of this but simply says "David Gentry, a blacksmith, married Tiana Rogers". This story may have originated because David, having married Mary Buffington, became a part of her clan according to Cherokee matrilinear customs. This may have been misunderstood later as indicating David himself was partly Indian. Based on his marriage to Mary Buffington, his date of birth has been estimated as approximately 1780. If David were a half-breed Indian, his father presumably would have been born in the time period of 1750 to 1760, and we must also presume that the father must have moved to Indian territory in the late 1770's when Kentucky and Tennessee first became available for settlement. There he could have met and married an Indian wife and there David would have been born. Such a prospective father of our "Cherokee David" would have had to have been a son of one of the earliest Gentrys who perhaps was looking for excitement and ventured along with traders like Daniel Boone into Indian territory. There is no record of any Gentry doing so, and from all that we know of the Virginia Gentrys of that period in their history, it would be possible but highly unlikely for a heretofore unknown Gentry to be such a father. If David was not part-Indian, we still have difficulty trying to identify possible parents, but there is at least a considerably larger choice. There are still certain parameters that must be met. If David was born in a more settled part of the country rather than in Indian Territory, he could have been the younger of a series of children, and his father could possibly have been born as early as 10 to 15 years before 1750. Even if he was born in Tennessee, for example, his parents would have been married elsewhere and moved there afterwards along with other older children. In addition, David would have appeared in the 1790 census if he were living in a locality where the census was taken. We should also consider both David's name and also the area of Tennessee to which he moved. As to the name David, this was a common one among the descendants of Nicholas-II and David-II. Among the known children of Samuel-II's sons, none include a David, nor is if found among the descendants of Joseph-II. Considering where westward movements occurred, any of the Gentrys who moved to Kentucky can be eliminated. This effectively rules out any of Nicholas-II's immediate family. [His son, Nicholas-III's family moved to Buncombe County, North Carolina, not far from the Hiawassee River Indian settlements, but they were far too young to be considered.] While John Roger's trading post on the Hiwassee River was more accessible from South Carolina and Georgia than Virginia, we cannot rule out Gentrys coming to eastern Tennessee, and then travelling down the Tennessee River. With the frequent Indian conflicts, such travel, however, generally involved passing through Indian territory as quickly as possible rather than lingering along the way. It will be helpful to see where Indian territory and organized counties of North Carolina, South Carolina, Tennessee and Georgia lay with respect to each other at the time of David's first marriage. From a geographical perspective, the odds of "Cherokee David" being of South Carolina background much outweigh any other source location, since John Roger's trading post was on the travel route for the Cherokees driven from their hunting grounds in South Carolina and Georgia going up to Tennessee where the refugee Cherokees were centered. 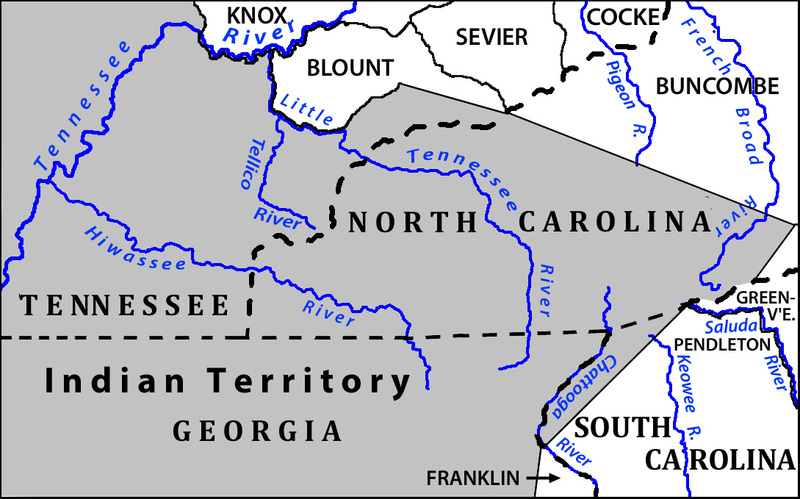 Even if he moved from Georgia to the Hiwassee River, all the Gentrys that were living in Georgia in the 1790's and early 1800's all originated in South Carolina. The movement of later South Carolina Gentrys into McMinn and Rhea counties illustrates the relative ease of access to southern Tennessee. Let us briefly consider all the possibilities for David's parents. Realistically these can be confined to the children of David-II, both by reason of geography, and also by reason of the name "David" being used frequently in that family, but not occurring for example in Samuel-II's family. These Gentrys were located in Abbeville and Edgefield Districts until 1800 when they started to spread into Greenville and Laurens Districts and into Georgia. Thus they all had ample opportunity for contact with the Cherokee Indians and for travel to their settlements. Reynolds had one son of right age to be "Cherokee David" but all evidence is against this son being David. Robert's three sons of correct age are believed to be other than David. -- David Jr. Not Likely A David Gentry of correct age present in Greenville Dist, SC in 1800 is thought to be son of David Jr. He was newly married in 1800, and is thought to have moved to AL. If this David was not David Jr.'s son then one of the latter's sons in the 1790 census is unidentified. -- John Possible John had one son who was in the 1790 and 1800 census who has not been identified and who was not in SC records after 1800. -- Allen Cain No Cain had three adult sons (over 16) living with him in 1790 and two younger sons. All of his sons can be accounted for. Not Likely Nathaniel's family not completely known. It is possible that he could have had a son or grandson of the correct age for "Cherokee David" but it is very unlikely. -- Simon Possible Simon had three sons under 16 years of age in 1790. Of these, one is un-identified and missing from records after 1790. -- Elisha No Elisha's will of 1803 accounts for all of his known children. He did have a son David but this David moved to TN and AR and died about 1841. -- Elijah Not Likely Not in any census records; moved from SC to GA then MS. Known children do not include any David. Elijah, and at least his son James were in Clarke County, GA as late as 1805, but it is possible a son could have left the family to go north into Tennessee before that time. Before leaving the subject of possible parents of David, we should mention that there was a competing David who was married to Delphy Bridgewater in Greene County, Tennessee, in 1803. This is another David whose parentage is not known. The marriage date conflicts with the proposed date of marriage of "Cherokee David" with Mary Buffington, and in addition, this other David was located along the North Carolina border, farther north in Tennessee than we would expect for someone who ended up in Indian Territory. There are fragmentary reports of Gentry orphan children living in Blount County, Tennessee, in about 1810, and it is possible they were children of the Greene County David. Because of the location of Greene County, this husband of Delphy Bridgewater, was much more likely to be related to the Gentrys who lived in the northeast corner of the state, possibly a son of an elusive Ayers Gentry. In summary, it appears there are two possibilities for the father of David, both sons of David-II. One of these was John, and the other Simon. If the author were forced to pick one most likely prospect for David's father, it would be Simon Gentry with the thought that David was with his father at the time of the 1790 census, and then left home after the death of Simon. Simon's widow, David's step-mother, was listed in the 1800 census, but Simon and one son were missing. The tale of Tiana and General Sam Houston has stirred the imagination of the romantically inclined, so there are many references in the literature to this alliance. As we look closer, the Cherokee records of her immediate family and of her first husband, David Gentry, are not entirely without question. But there appears to be enough truth to these records that one can confidently say that a David Gentry did indeed marry Tiana. We can guess that probably this David came from South Carolina, and was almost certainly a descendant of David-II and Sarah Brooks Gentry. The well-known Methodist preacher in Mississippi in the early 1800's, Elijah Gentry, was the son of Elijah Sr. and Hannah Gentry. Elijah married Wilmoth Killen in Mississippi two or three years before 1820 and the couple spent the rest of their life there, raising at least eight known children. Two controversies relate to this marriage, and recently surfaced again in the Queries and Comments section of the Journal of Gentry Genealogy for the months of February and March. The Journal will attempt to throw a little more light on this subject by outlining the facts as we see them. "Wilmoth Killen was known to be a Full blood Catawba Indian that married Jacob Elijah Gentry. James Gentry ( one-half Catawba Indian) married Caroline Bush . They are my GGG Grandparents. Their daughter Mary Elizabeth Gentry Gordon is my GG Grandmother. One of their (James and Caroline's) sons is William E. Gentry (one-quarter Catawba) and lots of information can be found in the Creek Indian Territory about him . These Gentry's were Catawba Indian (Catawba Indians are from the SC area originally) but were adopted into the Creek Nation in IT." "First The Elijah Gentry who was the Methodist minister who married Wilmoth Killen (and who was a son of Elijah, son of David, son of Samuel, son of Nicholas I), was never known as Jacob Elijah. Every tax record, every census record, every land record refers to him simply as Elijah. Examples include the census records of 1820 (Wayne Co MS), 1830 (Rankin Co MS), 1840 (Winston Co MS), 1850 (Neshoba Co MS) and 1860 (Neshoba Co MS), 1820 Wayne Co tax roll, 1827 land patent, and two Mississippi state statutes (one naming Elijah Gentry to a three-man committee to locate the courthouse and jail of the newly formed Rankin County and one naming Elijah Gentry as one of nine trustees of the Pearl River Academy). The only Jacob Elijah in the direct line is a grandson of Rev. Gentry (born August 5, 1852, son of the minister's son John Wesley). "Second Wilmoth Killen's family has been identified and she is NOT a full-blood Catawba, or indeed a full-blood Indian of any kind. She was born in 1795 in North Carolina, and is clearly the one female child under age 10 in the household of her father William Killen (spelled "Killin") on the 1800 Richmond County NC census. William Killen is believed to be the son of John Killen, one of several brothers who emigrated to America from Ulster, Ireland and settled in Delaware. Killen family history does not agree as to whether it was John or William who was born in Ulster, Ireland, but it is consistent that either William or William's father was born in Ireland. "Since James' adoption into the Creek Nation requires that his mother have been of Native American descent, Wilmoth Killen's Irish ancestry clearly means that Wilmoth was not James' mother. "Third Wilmoth and Elijah did not marry until after the 1816 territorial census. William Killen appeared on that census in Wayne County with two females 21 years of age or older. That is consistent with Wilmoth's date of birth of 1795. On the 1820 Wayne Co census, William Killen is shown with only one female in his household, a woman more than 45 years of age, thus showing that his daughter married between the date of the 1816 census and the date of the 1820 census. Elijah Gentry is then shown on the 1820 Wayne Co census with a wife aged 16-26 (thus born not earlier than 1794 and not later than 1804), and the members of the Killen family are all around the same area. In fact, the census entry for Wilmoth's younger brother William Jr. is directly beneath the entry for the Gentrys in 1820, her father William Sr. and older brother Henry on the next page. Further bolstering the later date of the Elijah-Wilmoth marriage is the fact that the minutes of at least one Conference of the Methodist Episcopal Church attended by Elijah Gentry as an itinerant minister after the probable birthrate for James Gentry show that all the ministers in the conference were unmarried. "Fourth the census records for the Gentry family clearly show that Elijah and Wilmoth had only eight children: Martha Ann Gentry, Elijah K. Gentry, Ira Bird Gentry, John Wesley Gentry, Nancy A. Gentry, Isabella Gentry, William Jefferson Gentry, George Washington Gentry. The only others ever to live in the household of Elijah and Wilmoth Gentry were Elijah's youngest brother, Josiah, and their mother, Hannah. All of the Gentry children were born in Mississippi, married in Mississippi, and, with the exception of Martha Ann, who cannot be traced after her marriage in 1836, all remained close to their parents in Mississippi until after Rev. Gentry's death (in 1850, for example, Elijah K., Nancy and Isabella were in Winston Co, Ira Bird in Attala Co, and John Wesley, William and George were living with their parents). By contrast, James was born in Alabama, was married in Alabama, remained in Alabama through the 1840 Coosa County census, and did not appear in Mississippi until 1850 when he first appears on the census in Chickasaw County, some distance away from any of the Elijah Gentry family." "It is certainly possible that James Gentry was the son of some Elijah Gentry, perhaps even some Jacob Elijah Gentry. It is even possible that there may be some connection between James Gentry and Rev. Gentry. James may well be a grandson of Elijah Gentry Sr., father of Rev. Elijah Gentry, or of one of the elder Elijah's many brothers, and thus a cousin of Rev. Elijah Gentry. There is, however, no evidence that he was the son of Rev. Elijah Gentry, much evidence to suggest that he was not the minister's son and he absolutely cannot be the son of Wilmoth Killen Gentry, the wife of Rev. Elijah Gentry." "Another known son of Elijah and Hannah Gentry is Elijah Gentry, born in Georgia, c.1787 who married first -?- an Indian and had a son named James G. Gentry. James G. Gentry is listed on the 1850 Chickasaw County, Mississippi census at page 271 with wife Carolina Bush, a Creek Indian and their family. "One daughter [of James] was Vicey Rebecca Gentry. She married Hermogene LaBlanc (it is spelled "Lerblanche" today); they had one known son, Hermogene Elijah Lerblanche. LaBlanc, says Karen Beare, one of their descendants in Checotaw, Oklahoma, was a Louisiana Frenchman and he left Vicey Rebecca and she never heard from him again. There may have been other children of Elijah and his Indian wife we do not known about." Correspondent B presents persuasive evidence that if Elijah had an Indian wife, it was certainly not Wilmoth Killen. Consequently the claims of Correspondent A appear to be unfounded as she presents them. The former's comment that Elijah was an itinerant preacher in the Methodist Episcopal Mississippi Annual Conference, does not entirely dispose of the possibility that Doris Bias raises. Census records in Neshoba County, Mississippi, in 1850, indicate Elijah was born about 1787 in Georgia. This age is consistent with his age in census records in previous Mississippi listings: in 1820 (Wayne County), 1830 (Rankin County), and 1840 (Winston County). The date of Elijah's marriage to Wilmoth is not known precisely, but it appears to be between the time of the 1816 census Correspondent B mentions, and the birth of their first daughter Martha Ann, and two sons Elijah Killen and Ira Bird Gentry, all before 1820. James Gentry's entry in the 1850 Chickasaw County, Mississippi census indicates a date of birth of about 1814, a year when Elijah was about 27 years old. Elijah's father was last known to be in Clarke County, Georgia in 1805, then moved to Mississippi where he died in about 1817. This leaves a considerable span of time in Elijah Jr.'s early life during which nothing is known of his whereabouts or activities. We cannot say with assurance that he did not marry an Indian woman in that time (whether it was a formal ceremony that Elijah considered binding, or was an Indian ceremony that he may have considered to be of no more concern than that of Sam Houston for his wife Tiana). In the records of the Methodist Episcopal Mississippi Annual Conference which was first formed in 1813, Elijah was first included in the Conference annals as being "continued on trial" in 1815, and being "elected to deacon's orders" in 1816. In the first year of existence of the Annual Conference, in 1813, Elijah's brother Simon is listed as being "admitted on trial", but there was no mention of Elijah. For the sake of argument, let us say that Elijah and Wilmoth were married about 1816 or 1817, after Elijah was elected a deacon of the church. [Note comments below and added reference 2a which would date Elijah's marriage probably in 1817 when he "located" and left the itinerancy.] If indeed, Elijah Jr was married once before his marriage to Wilmoth, between the birth of James and Elijah's entry into the ministry, there were almost certainly two or three years of time when Elijah was indeed unmarried. James G. Gentry's indication of Alabama as being his place of birth, may or may not have been accurate. Elijah's son, Ira Bird Gentry, is listed in the 1850 Attala County, Mississippi census as also being born in Alabama. To the extent that Ira's place of birth was mis-stated, James' place of birth may also have been mis-stated, or as Correspondent A indicates, James may have been born in a section of Mississippi that was considered to be part of Alabama at the time. Neither census record can be relied upon as being completely authentic. Of further interest, is the fact that this James, if indeed a son of Elijah, was probably named for Elijah's older brother, James Gentry, the presumed oldest son of Elijah Sr. and Hannah Gentry. In any case, if the younger James was a son of Elijah Jr., he was obviously not raised with Elijah's family and may have lived with Indian relatives (or with his mother if she was still alive) in Alabama. Subsequent to the first publishing of this article, additional information was forwarded to the editor<2a,b>. In the interests of complete disclosure and preservation of evidence, we are adding the material to this article. The first piece of additional evidence is the fact that Elijah's service as an itin erant Methodist preacher started as early as November 1814. This was while Mississippi was still being served by the Tennessee Annual Conference. Elijah continued in this itinerant service until the 1817 conference at which time he "located" and gave up his travelling duties (usually this was done when the preacher married and took on family duties). The second contribution of additional evidence concerns the record of Elijah Jr and Elijah Sr's service as volunteers in the Mississippi militia in the War of 1812. These facts do not seem to lessen the possibility that Elijah Jr was the father of James G. Gentry . Elijah's brief episodes of military service were not likely to have seriously affected his home life and they confirm the fact that the family was living in Mississippi by at least early 1814. There is the possibility of Elijah fathering a son with one of the camp followers that may have accompanied the army, or with some local woman during a period of encampment, and leaving the mother behind when he left the service, (quite possibly without knowing she was pregnant). There are many instances of this in modern times as in Vietnam. It would help to explain the termination of the relationship if indeed Elijah was involved, and the fact that James apparently was raised entirely by his mother or her family and never had any contact with Elijah. As to Elijah's ministerial life after his army service, there are many cases where a man "gets religion" and undergoes a radical change in lifestyle. The question has been raised as to why Elijah and Wilmoth Killen should have to try to prove that as a couple, or Elijah individually, were not parents of James. This is a legitimate observation. The argument is that if someone wishes to assert that Elijah was James' father, it should be up to them to provide proof of such. No such proof has been offered to date and it appears that from present information we have no way of proving this relationship. On the other side, one can also say there is no proof that such a relationship could not have been possible. So the question is at a stand-off. It will be helpful in these discussions to provide more information about the activities of the Gentrys – father, Elijah Sr., and sons, James and Elijah Jr., and the military situation that prevailed locally during the War of 1812. The war so far as it affected Mississippi and Alabama was primarily fought between settlers and Creek Indians ["Red Sticks"] until the final battle of New Orleans which was the only time there was active intervention by the British. Furthermore, the Indian hostilities were due to a civil war between two factions of the Indians tribes. In January 1813, in response to a call for military protection from Indian raids, the 1st Regiment Mississippi Territory Volunteers was organized under the leadership of Col. Carson. The records of this regiment show Elijah Sr., Elijah Jr., and James Gentry all serving as privates, but with no record of when they enlisted. A great majority of the personnel voluntarily enlisted rather than being drafted for compulsory militia service, we assume the Gentrys did the same. The initial call for service was in general for six months. This regiment was disbanded in January 1814 after the enrollment period for most of its personnel had expired. Elijah Sr. may have left earlier, but it is probable that the two younger Gentrys, were discharged at this time. James enlisted again briefly in the 15th Regiment Mississippi Militia stationed in Clarke, Alabama, under Col. Johnson. He is listed in their rolls as a private on entry and departure but with no indication of when he enlisted and when he was discharged. Finally, both Elijah (Jr.) and James enrolled once more in Major Samuel Dale's Battalion, a part of the Mississippi Territory Infantry Volunteers. This was a military force that was organized after the termination of the 1st Regiment. Their mission was "to cooperate with the 3rd Regiment [U.S.] Infantry against hostile Creek Indians". Elijah and James are listed in the rolls of Capt. Austill's Company. National Archives compiled service records of Mississippi soldiers confirm the presence of each in this company. Both entered as privates, James was discharged as a sergeant. James' record indicates that he enlisted 1 Feb 1814 for one month. Elijah's record simply says date of enlistment and time of service were "Not Stated", but we can assume that they probably served together. So much for their service record. What was going on doing during this time. 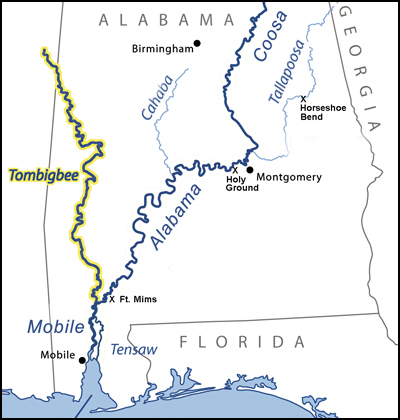 The 1st Regiment along with other troops under the command of Gen. Claiborne was sent, accompanied by Choctaw Indian allies, to the area of the Tombigbee River (flowing south into Mobile Bay, see Fig. 3) because of Creek hostilities. They arrived late July at Mt. Vernon, Alabama. Two companies were sent to garrison Ft. Mims on the Alabama River. This garrison was massacred August 30th by a group of Creek Indians, with only a handful of military or civilian survivors. This provoked a drive south by Gen. Andrew Jackson with troops from Tennessee to attack Indian towns and warrior gatherings along the Coosa and Tallapoosa Rivers in Alabama. This culminated in a final victory, 27 Mar 1814 at Horseshoe Bend. This in turn led to the signing of the Treaty of Fort Jackson in which the Creek Indians ceded twenty-three million acres to the U.S. Government . In the meantime, the Mississippi 1st Regiment was stationed for some three months during the fall of 1813 near Mobile to guard against any attack by sea from the British. In a final campaign, the regiment was sent in December to destroy an Indian camp at Holy Ground. Gen. Claiborne's comments when the regiment was discharged in January 1814 were "My volunteers are returning to their homes with eight months' pay due them, and almost literally naked. They have served the last three months of an inclement winter without shoes or blankets and almost without shirts, but are still devoted to their country and properly impressed with the justice and necessity of the war." How does all this affect the discussion about Elijah having an Indian wife? The known facts do not in any way exclude this possibility. One can well imagine that during the months that Elijah was stationed along the lower Tombigbee/Alabama Rivers, he could have met the mother of James G. Gentry and "married" her. The fact that the young child, James is said to have been born in 1814 in Alabama fits this scenario perfectly. If indeed James was Elijah's son, he may or may not have been aware that James' mother was pregnant. The mother may have known before Elijah left, but presumably preferred to remain with her family to raise the child among her fellow Indians when Elijah was discharged and returned home. This is exactly the situation that Tiana Rogers Gentry Houston later chose rather than follow Sam Houston to Texas. Anecdotal, family tradition in the family of James G. Gentry asserts that he was part Indian, and this tradition has claimed that James was a son of Elijah Gentry and Wilmoth Killen. No direct evidence of this has been provided. It appears evident from what our correspondents have written, that Wilmoth Killen was in no degree Indian; and if James was part Indian, he was certainly not a son of hers. It is further evident from what is known of Elijah Gentry, that the predominance of evidence indicates there was the possibility that Elijah could have acquired a formal or informal Indian wife, name unknown, in late 1813 who was the mother of this child before Elijah married Wilmoth. The evidence may not be compelling, but the author is inclined to favor this interpretation of facts. 1. J.J. Hill, "Old Cherokee Families", "Old Familes and their Genealogy", reprinted from "History of the Cherokee Indians and Their Legends and Folk Lore" by Emmet Starr, Oklahoma City, 1921, pages 303-476. Reprint and index, Norman, OK 1968. Note Ludovic Grant, who was said to have been a Scotchman, in a statement recorded on page 301 of the Charlestown, South Carolina probate court in the book of "1754-1758" in a sworn statement of Janueary 12, 1756, says "It is about thirty years since I went into the Cherokee Country where I have resided ever since" "I speak their language". He married a full blood Cherokee woman of the Long Hair Clan. He was among the Cherokees at the same time that Christian Priber and James Adair was in the nation. Grant's half breed daughter married William Emory, an Englishman. 2 Elizabeth Emory. Robert Due and John Rogers. Note Rim Fawling, Ezekial Buffington, Robert Due and John Rogers were Englishmen. 5 Susannah Buffington. Jeffrey Beck and Surry Eaton. Note John Rogers' first wife was Elizabeth Due nee Emory and his second wife was his step-daughter Jennie Due. 2. Judy Russell, in a private communication to the editor. "The first reference to Elijah as an itinerant was not on the records of the MISSISSIPPI Conference, because Mississippi was part of the TENNESSEE Conference until 1815. So the first reference is on November 14, 1814, when Elijah Gentry was admitted as a junior itinerant preacher for the Tennessee Conference at a meeting in Logan County, KY, and assigned to the Pearl River District in Mississippi." "At the 1815 conference, he was received into full connection, continued as an itinerant and assigned to the Amite district for the year 1816. "At the 1817 conference, he "located" (gave up his itinerant status and salary but continued to preach locally). That is ordinarily done because of marriage and responsibilities of a family. " A book""Mississippi Territory in the War of 1812", written by Dunbar Rowland in 1908 and reprinted in 1978 by Mrs. Rowland is accessible at multiple locations online. It is the standard source for the majority of detailed information about Mississippi military units and their personnel. More material is included here than was originally published. James Gentry – entered as Private, discharged as Private. James Gentry – entered as Sergeant, discharged as Sergeant (p.224).